Rubella is now rare because of widespread compliance with childhood immunization programs. The disease is usually a benign and inconsequential viral illness unless exposure occurs in utero. Congenital rubella syndrome is associated with clinically significant congenital malformations. The live-attenuated virus vaccine has decreased the incidence of rubella significantly, thereby decreasing congenital disease. See the image below. 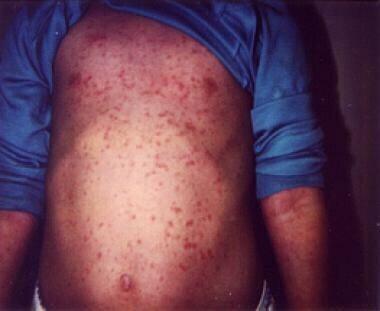 Image in a 4-year-old girl with a 4-day history of low-grade fever, symptoms of an upper respiratory tract infection, and rash. Courtesy of Pamela L. Dyne, MD. The causative organism is a single-stranded RNA togavirus that is transmitted by means of respiratory droplets. The virus replicates in the nasopharynx and regional lymph nodes, resulting in viremia. The virus then may spread to the skin, CNS, synovial fluid, and transplacentally to a developing fetus. Before the rubella vaccination became available in 1969, epidemics occurred every 6-9 years and pandemics every 10-20 years. In 1977-1981, 20,395 cases of rubella were reported in the United States. According to Statistical Handbook on Infectious Disease regarding historical trends of rubella in the United States, the incidence has significantly decreased since that time. In 1990, 1124 cases of rubella occurred, and, in 1999, only 267 occurred. In the last decade, the rate has been less than 10 cases of congenital rubella syndrome per year. These cases mostly affected mothers born outside of the United States in Latin American countries with lower vaccination rates. A recent case control study, presuming it to be a random variation, found a correlation between early rubella vaccination (before age 10) and later development of multiple sclerosis. Another recent study shows that immigrant women in Canada had surprisingly low vaccination rates; this highlights the risk of epidemics in areas with significant immigrant populations. Vaccination rates remain very high in the United States; should this change in the future, the frequency of rubella could change dramatically. The rubella vaccination is given to only about half the world's population. Congenital rubella syndrome remains a major problem in some areas. In Russia, for instance, congenital rubella syndrome causes 15% of all birth defects. Infection in healthy children or young adults is generally self-limited and without sequelae. The most common complications are arthropathies of the fingers, wrists, and knees that can persist for a year or more. Thrombocytopenia with purpura and hemorrhage is a rare complication of rubella. Congenital rubella syndrome is associated with malformations of multiple organ systems including the CNS and cardiac, ocular, and skeletal systems. Infants with congenital rubella syndrome who survive into adulthood may be plagued by autoimmune disorders and dysgammaglobulinemia. Damage to the fetus is most likely when maternal infection occurs during the first 2 months of pregnancy, although there is risk associated with infection up to 5 months. The highest risk is among members of racial or ethnic groups who are unvaccinated and who may be exposed to persons traveling from areas where rubella vaccination is not routine. Recent outbreaks have occurred among persons of Hispanic ethnicity. Consequently, Hispanic persons and persons from countries without rubella vaccination programs should be considered susceptible to rubella unless they have documentation of vaccination or serologic evidence of immunity. Rubella affects men and women equally. Before vaccination, the peak incidence occurred in children aged 5-14 years. However, at present, most cases occur in teenagers or young adults. Molina IB, Mendoza LO, Palma MA. Congenital rubella syndrome surveillance in Honduras. J Infect Dis. 2011 Sep 1. 204 Suppl 2:S637-41. [Medline]. Watstein SB, Jovanovic J. Statistical Handbook on Infectious Diseases. Westport, CT: Greenwood; 2003. 5. CDC. Elimination of rubella and congenital rubella syndrome--United States, 1969-2004. MMWR Morb Mortal Wkly Rep. 2005 Mar 25. 54(11):279-82. [Medline]. Elliman D, Bedford H. MMR: where are we now?. Arch Dis Child. 2007 Dec. 92(12):1055-7. [Medline]. Schmid D, Kasper S, Kuo HW, Aberle S, Holzmann H, Daghofer E. Ongoing rubella outbreak in Austria, 2008-2009. Euro Surveill. 2009. 14(16):[Medline]. Ahlgren C, Toren K, Oden A, Andersen O. A population-based case-control study on viral infections and vaccinations and subsequent multiple sclerosis risk. Eur J Epidemiol. 2009 Jul 26. [Medline]. McElroy R, Laskin M, Jiang D, Shah R, Ray JG. Rates of rubella immunity among immigrant and non-immigrant pregnant women. J Obstet Gynaecol Can. 2009 May. 31(5):409-13. [Medline]. Rubella and congenital rubella syndrome control and elimination - global progress, 2000-2012. MMWR Morb Mortal Wkly Rep. 2013 Dec 6. 62(48):983-6. [Medline]. Henderson D. Ramped-Up Campaign Lowers Global Rubella Cases by 86%. Medscape Medical News. Available at http://www.medscape.com/viewarticle/817409. Accessed: December 18, 2014. Knuf M, Zepp F, Helm K, Maurer H, Prieler A, Kieninger-Baum D, et al. Antibody persistence for 3 years following two doses of tetravalent measles-mumps-rubella-varicella vaccine in healthy children. Eur J Pediatr. 2012 Mar. 171(3):463-70. [Medline]. Gomber S, Arora SK, Das S, Ramachandran VG. Immune response to second dose of MMR vaccine in Indian children. Indian J Med Res. 2011 Sep. 134(3):302-6. [Medline]. [Full Text]. Siberry GK, Patel K, Bellini WJ, Karalius B, Purswani MU, Burchett SK, et al. Immunity to Measles, Mumps, and Rubella in US Children With Perinatal HIV Infection or Perinatal HIV Exposure Without Infection. Clin Infect Dis. 2015 Sep 15. 61 (6):988-95. [Medline]. CDC. CDC. Centers for Disease Control and Prevention: Morbidity and Mortality Weekly Report. Achievements in Public Health: Elimination of Rubella and Congenital Rubella Syndrome—United States, 1969-2004. JAMA. 2005. 293:2084-6. Fisher RG, Boyce TG. Prenatal infections. Moffet's Pediatric Infectious Disease: A Problem-Oriented Approach. Lippincott Williams & Wilkins; 2005. 631-2. Lemstra M, Rajakumar D, Thompson A, Moraros J. The effectiveness of telephone reminders and home visits to improve measles, mumps and rubella immunization coverage rates in children. Paediatr Child Health. 2011 Jan. 16(1):e1-5. [Medline]. [Full Text]. Maldonado Y. Rubella. Behrman RE, Kliegman R, Jenson HB, eds. Nelson Textbook of Pediatrics. Philadelphia, PA: WB Saunders; 2004. 1032-4. Mercurio MG, Elewski BE. Cutaneous manifestations of systemic viral, bacterial, and fungal infections and protozoal disease. Dermatologic Signs of Internal Disease. 2nd ed. 1995. 254. Palacin PS, Castilla Y, Garzon P, Figueras C, Castellvi J, Espanol T. Congenital rubella syndrome, hyper-IgM syndrome and autoimmunity in an 18-year-old girl. J Paediatr Child Health. 2007 Oct. 43(10):716-8. [Medline]. Sanchez PJ. Viral infections of the fetus and neonate. Feigin RD, Cherry J, Demmler GJ, Sheldon S, eds. Textbook of Pediatric Infectious Diseases. Philadelphia, PA: Saunders; 2004. 881-5. Smith A, Yarwood J, Salisbury DM. Tracking mothers' attitudes to MMR immunisation 1996-2006. Vaccine. 2007 May 16. 25(20):3996-4002. [Medline]. The authors and editors of Medscape Reference gratefully acknowledge the contributions of previous author, Kelli N McCartan, MD, to the development and writing of this article.